JFrog Artifactory is one of the leading repository management solutions. 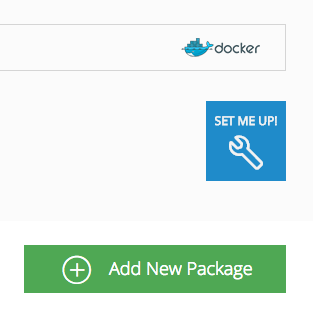 Originally a generic package management solution, it has now expanded to cover Docker images as well. JFrog is also the company behind Bintray, the SAAS version of Artifactory offering the same storage capabilities in the Cloud. In this article, we will see how we can push Docker images and binary artifacts in Bintray. Artifactory can also be used in a similar manner for companies that prefer an on-premise JFrog installation. 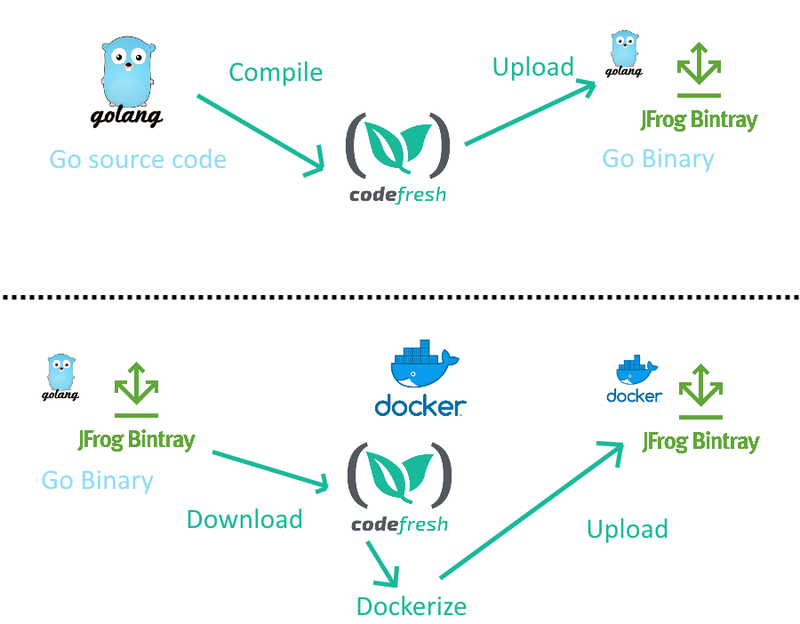 Codefresh has native support for external Docker registries and it is very easy to connect JFrog Bintray as a compatible Docker registry in Codefresh pipelines. Once that is done, pushing and pulling Docker images from Bintray is no different than any other Docker registry (Bintray follows closely the Docker registry specification). we will see the usage of Bintray as a binary package manager, by pushing and pulling binary artifacts instead of Docker images. If you don’t have already a Docker repository in Bintray you can create a new one by choosing the “Docker” repository type during creation. 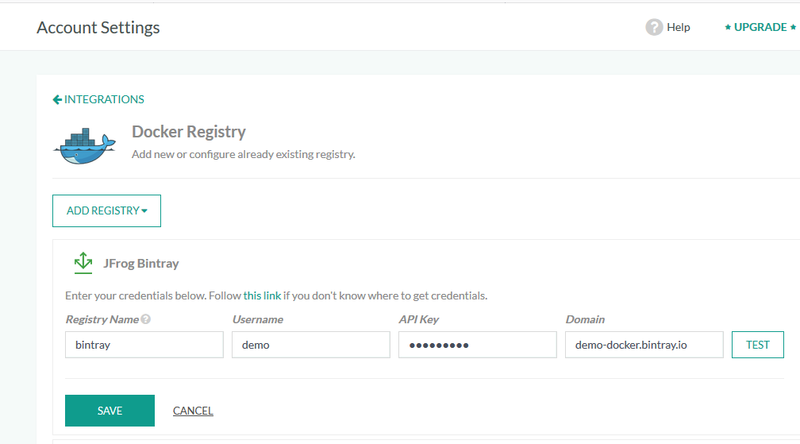 With the Bintray API key and repository domain at hand, go to your account Settings in Codefresh and select the Docker registry Integrations. The domain of the Bintray repository. Once everything is filled, click the “Test” button to verify the settings and then the “Save” button to apply all changes. Bintray is now set up in Codefresh! This is the easiest way to use Bintray from within Codefresh (as a Docker registry) and should be effective if all your pipelines are based on Docker images. You can find all code for this blog post at https://github.com/codefresh-contrib/cfstep-bintray. 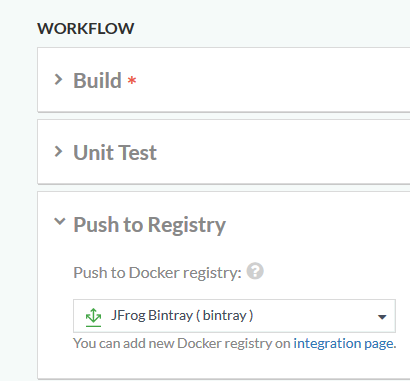 In the previous section, we have seen how easy is to use Bintray as a Docker registry inside Codefresh. One of the major characteristics of Bintray is the fact that it supports any kind of binary artifact and not just Docker images (the same is also true for Artifactory). You can use Bintray to store npm, Maven and Debian packages, and even generic artifacts. The first pipeline compiles the GO source code, creates a binary and uploads it directly to Bintray (treating Bintray as a generic binary repository). 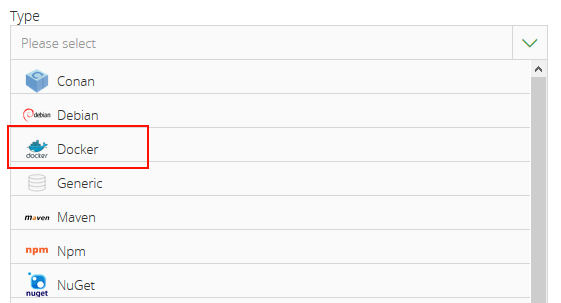 The second pipeline downloads the premade Go binary (treating Bintray as a generic repository), packages it into a Docker image, and uploads it to Bintray again (this time using Bintray as a Docker registry). You should now see the dual role Bintray can play. At the end of the first pipeline (and the beginning of the second one), it acts as a Go Binary repository. At the end of the second pipeline, it acts as a Docker registry. To interact with Bintray (as a generic binary repository) we will use the JFrog CLI. 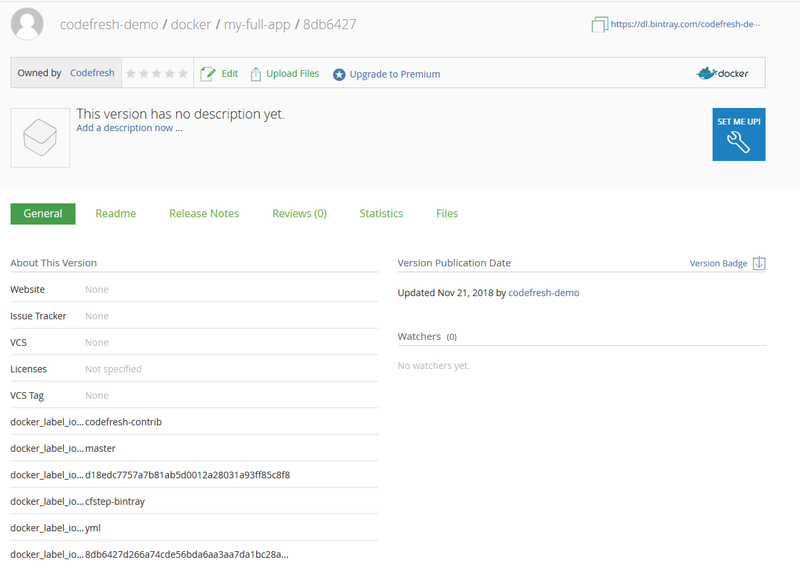 Since JFrog doesn’t offer a premade Docker image with its CLI, we created our own that can be found at codefresh/jfrog-cli. This is a single wrapper on top of the CLI. We use in the pipeline two variables: BINTRAY_USER, and BINTRAY_KEY, which are the Bintray username and API as mentioned in the previous section. For the second pipeline we download this binary, add it into a Docker image and upload it again (this time in the Docker repository in Bintray). Notice that the Dockerfile we use in the second file is a special one that expects the GO binary to be present. A simple pipeline where we upload a Docker image directly to Bintray (treating it a Docker registry). A more complex scenario where we upload a binary artifact to Bintray from one pipeline, and then download it and Dockerize it in a second pipeline (treating Bintray as a generic artifact repository). 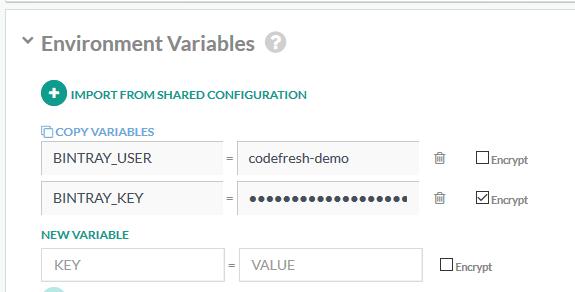 You are now ready to use Codefresh and JFrog Bintray together in your own pipelines. Remember that the code for the plugin itself as well as the pipeline is available at Github. 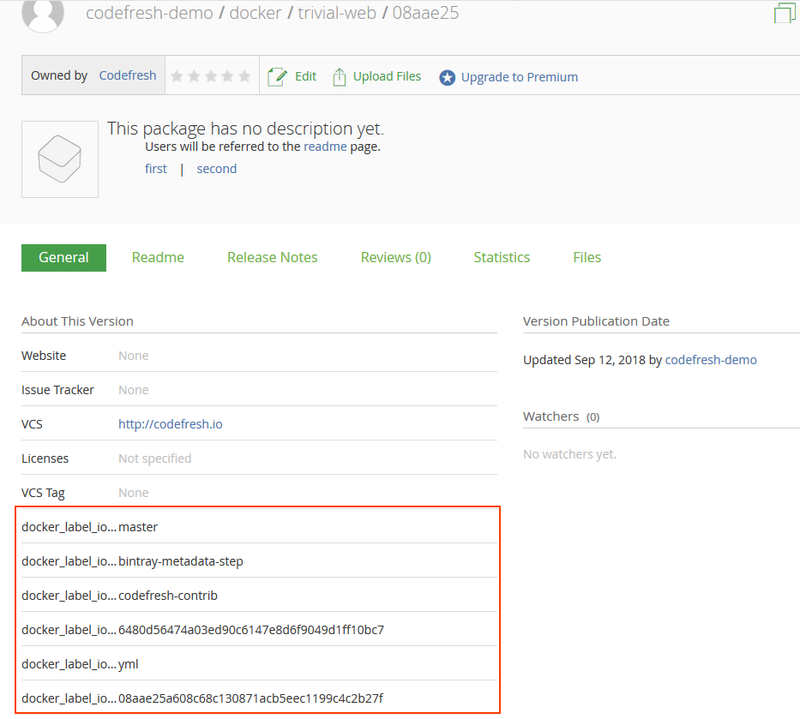 The plugin image can be found at https://hub.docker.com/r/codefresh/cfstep-bintray/.